As the name suggests, the Titan Hybrid Vaporizer is a hybrid vaping device that is a cross between an electronic cigarette and a box mod vaporizer. It comes complete with a choice of two atomizer coils and, when the Blue Ring Coil (0.5 ohm) is in use the Titan works as a SUB-OHM Box Mod Vaporizer. Anyone who prefers the idea of vaping an electronic cigarette can make the switch by using the Green Ring Coil (1.0 ohm) instead. When the Green Ring Coil is in use, the vapour passes through the mouth before it enters the lungs (MTL). Anyone who would rather have the vapour shot directly into the lungs, in hookah style, needs to use the Blue Ring Coil. Most people are creatures of habit and tend to stick to their favoured routines, so it’s likely that a lot of vaping enthusiasts will stick to one or the other, but it’s nice to have a choice and anyone who relishes the idea of doing a regular swaperoo, and vaping in different ways, may find the Titan is perfect for their needs. With a length of just 122mm, and a 19mm diameter, the Titan is a pretty compact device, but it has a 3ml tank capacity, so it would be foolish to dismiss this vaporizer out of hand. At first blush, the battery rating (1100mAh) may also seem a little inadequate, but the fact that the Titan is so small allows it to a darn good job and power a full day’s worth of vaping. EPUFFER is one of the most respected vaping product producers and distributors in the world. The company has a good reputation for providing high-quality vaping devices and have enough confidence to offer customers a 30-day money back guarantee. The company also offers a reasonably diverse range of e-liquids, so some vapers may find the EPUFFER website can provide everything they need. Customers who buy the Titan Hybrid Vaporizer, or any of the company’s other products are offered an excellent level of after-sales service and customer support representatives are available by phone during normal office hours (Mon-Fri: 9:00 – 18:00). It is also possible to open an online support ticket 24-hours a day. At the time of this review, customers were also provided with a free bottle of e-liquid, and several strength and flavour options were available. The sales page said it was a “special introductory offer” that was only available “while stocks last”, but were guessing the offer of free e-liquid will be around for all time. Company’s often use the “while stocks last” angle to encourage customers to make a snap decision and buy there and then. In this case we are surprised EPUFFER felt such an action was needed because the Titan Hybrid Vaporizer is such a good piece of kit. EPUFFER offers free first-class shipping on all orders over £25, and customers in the UK should receive their order within two working days. What Does the Titan Hybrid Vaporizer Cost and is it Worth the Money? At the time of this review it was possible to buy a Titan Hybrid Vaporizer for just under £50. That’s about the same as a pack of 100 Silk Cut Silver King Size cigarettes, so the price is not unreasonable for a vaporizer of this quality, and EPUFFER are offering customers a 30-day money back guarantee and one year’s warranty. 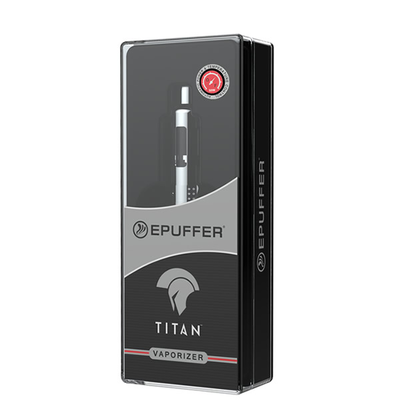 You can buy a Titan Hybrid Vaporizer from the EPUFFER website. The Titan Hybrid Vaporizer is a neat little vaporizer with a lot of style. It is not by any means the cheapest vaporizer available, but nor is it the most expensive; and a quality device like this should provide many years of happy vaping. 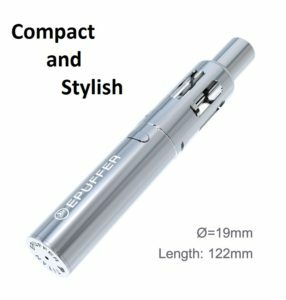 The compact size is also likely to make it a perfect choice for anyone who wants as little extra bulk as possible in their pocket or purse. If you have minimalist tendencies, the Titan could prove to be just the ticket. The fact that so many customers appear to love this product is also a point in its favour, and the money back guarantee provides cautious buyers with extra peace of mind. The Titan Hybrid Vaporizer is a pretty nifty piece of kit.